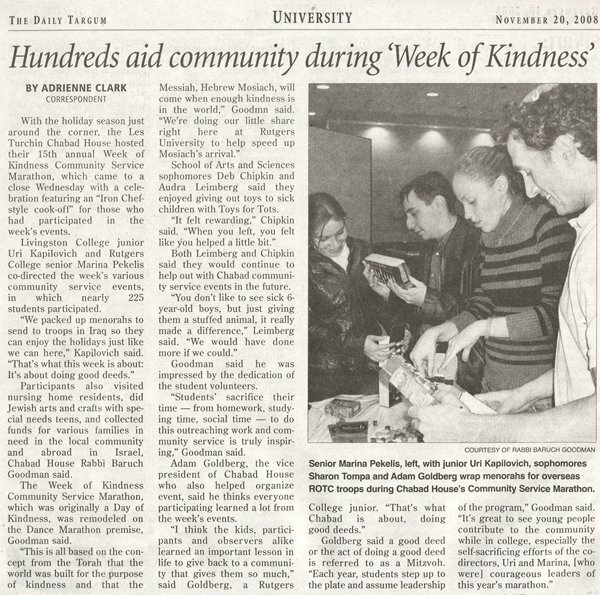 With the holiday season just around the corner, the Les Turchin Chabad House hosted their 15th annual Week of Kindness Community Service Marathon, which came to a close Wednesday with a celebration featuring an “Iron Chef-style cook-off” for those who had participated in the week’s events. 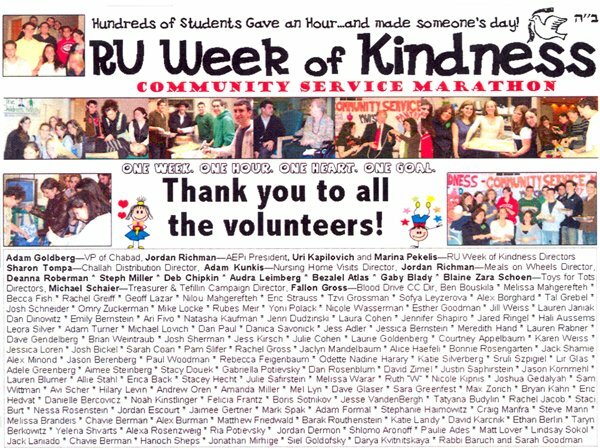 Livingston College junior Uri Kapilovich and Rutgers College senior Marina Pekelis co-directed the week’s various community service events, in which nearly 225 students participated. Participants also visited nursing home residents, did Jewish arts and crafts with special needs teens, and collected funds for various families in need in the local community and abroad in Israel, Chabad House Rabbi Baruch Goodman said. The Week of Kindness Community Service Marathon, which was originally a Day of Kindness, was remodeled on the Dance Marathon premise, Goodman said. School of Arts and Sciences sophomores Deb Chipkin and Audra Leimberg said they enjoyed giving out toys to sick children with Toys for Tots. Both Leimberg and Chipkin said they would continue to help out with Chabad community service events in the future. Goodman said he was impressed by the dedication of the student volunteers. “Students’ sacrifice their time — from homework, studying time, social time — to do this outreaching work and community service is truly inspiring,” Goodman said. Adam Goldberg, the vice president of Chabad House who also helped organize event, said he thinks everyone participating learned a lot from the week’s events.